Kings Mountain National Military Park NPS website. Scheduled events page at KM NMP (NPS) website, limited to events at the park. Overmountain Victory National Historic Trail NPS website. A lot of information relating to the Kings Mountain battle and to Kings Mountain National Military Park is found here. Bookstores: Relating only to KM and the OVNHT. Kings Mountain NMP Collection of Artifacts from the Museum Collections webpage. FWIW. Overmountain Victory Trail Association website. Some history. Some specifics on how the march re-enactment/encampments are conducted and responsibilities of participants. How to join. The Battle of Kings Mountain from the Cleveland Co. NC website. Kings Mountain monument [68k] from a great page of pictures of Carolinas battle sites from the The Real Unofficial Battleground Page. Overmountain Victory Trail Click on green text. From the South Carolina's State Trails Program website. Overmountain Victory Trail from the National Parks Foundation. Historical overview from Kings Mountain study site of the University of South Carolina - Aiken. The role of Tennesseeans from the TN Department of State website. The Revolution. A 6 sentence summation of TN involvement. From the "Tennessee Handbook". Search for "revolution". Sycamore Shoals State Historical Park, Elizabethton TN. Mustering point for march to Kings Mountain. Gillespie Gap. Intersection of Blue Ridge Parkway and NC 226. 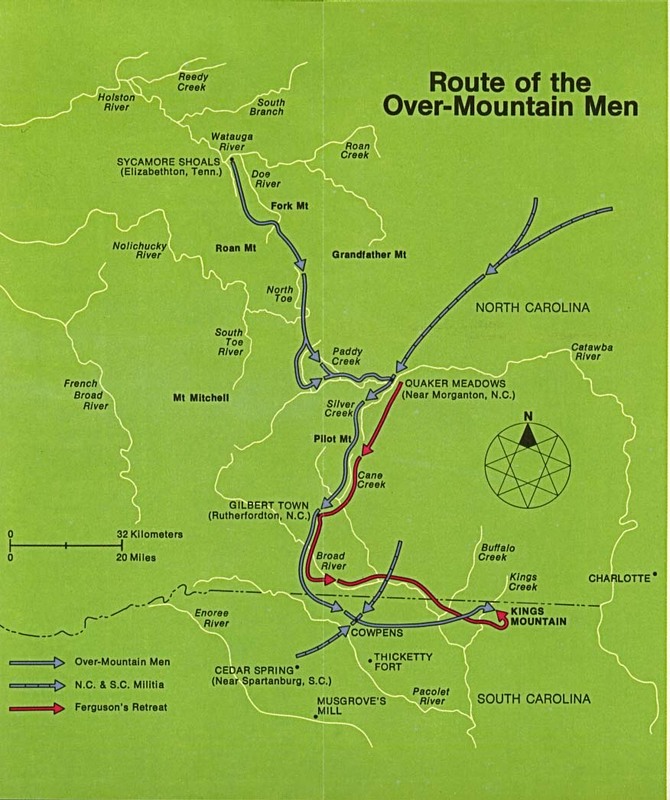 Route taken by Overmountain Men from Sycamore Shoals. John Denton, Patriot - Pioneer. Includes an account of the Overmountain Men having to deal with a British-instigated attack by Indians immediately upon their return home. Sights Magazine: KM NMP pictures of "overmountain man", Ferguson and Shelby. Kings Mountain Battle from Battles of the American Revolution. Use right-click and 'View' on pictures for larger view. Kings Mountain NMP. Good summary of facilities and area. Also info on state park. By Scott Brumley. Turning Point in the Wilderness by Tom Wicker. Tennessee - A Chronology of Events. KM only RW battle listed! The unexpurgated version of Ferguson's proclamation to the "Backwater Men" from Ed St.Germain. Sheds some light on later irregular treatment of Ferguson's remains. Nathan Gann credited with first shot felling Ferguson from Bobby G. Carwile. Gives some specifics on treatment of Ferguson's remains.